"Why buy a slug when you can own a Bullet?" Robert Blakely is only 30 but already he's making waves in the boat-building industry. The Kingston man started as a class 'A' mechanic years ago; but "that was too boring," he said Saturday prior to the run in Gananoque. "I needed more of a challenge, so I started building supercharged engines." Now he owns Bullet Engines in Kingston and has more than 180 motors in the water. Two such off-shore boats were here for the poker run. "Gary Driver of Montreal is in a 41-foot cigarette boat with 510 CIDs, and Arnold CoIller of Buffalo is in a 37-foot Baja with 510 CIDs," he said. 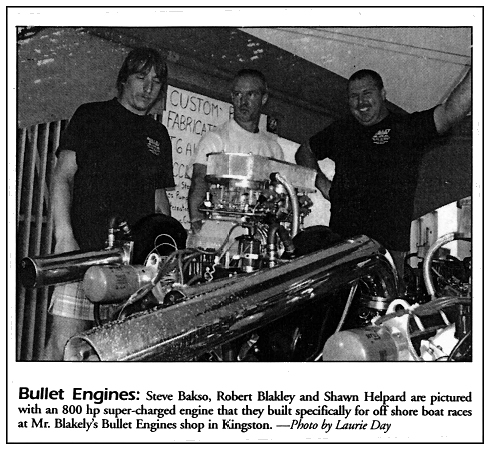 Mr. Blakely built his own 670 hp, 502CID motor for his 24 foot off-shore boat. It can travel up to 87 miles-an-hour. This motor is one of 15 he had in the event. "I like to buzz my motors high," he said. "I don't like to release the cam specs, but I know how to make it work." He is always trying to make his motors bigger and better to keep the public happy. He expects off-shore racers will be in for a shock in the new millennium. "Within the next year, people won't be ready to see what's coming. Speed and reliability will be guaranteed. My new motors will be bigger, badder and faster."